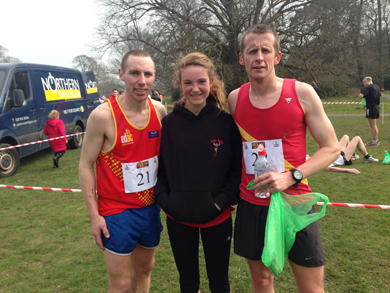 Benny Teer, Aoife Cochrane winners of Spring Lakes 10K and 5K races respectively on Sunday and Martin Willcox who also competed in the 10K. After last week’s heroics in Larne it was surely too much to expect similar performances in Omagh this week. But just to prove it was no fluke Barrie Atkinson again franked the form book with another pb, clocking 1.14.35 to take 8th place overall in a high class field and claiming several notable scalps in the process. Another East Down man with cause to celebrate was Gerard McAuley, who took 7 minutes off his previous best for the distance. In spite of the re-positioning of several space satellites and a double check of his own Garmin it proved impossible to find evidence of a sub 87 minute timing and with the evidence provided by his electronic chip he finally settled for 1.28.05, a splendid time anyway but which leaves room for further improvement in the not too distant future. James Magennis also expressed his satisfaction with 1.38.22 just behind a returning to form Michael McKeown 1.37.50. At the same venue, Daniel Atkinson posted an excellent 21.11 in the 5K family fun run. Then it was on to Sunday and Castlewellan AC’s presentation of the Spring Lakes 5 and 10K races. Again there was cause for double celebration for East Down as Brendan Teer took the 10K title for the second year in a row while Aoife Cochrane gave notice of her arrival in senior company with a consummate performance to claim the 5K award. Sunday 20th April provides an opportunity for an Easter boat ride to Portaferry and onwards by free minibus to Ballygalget for the increasingly popular 10K race and 5K Walk. An excellent reception is guaranteed with first class post race refreshments on offer. With a 12 noon start it still leaves time for everyone to find a place to roll the eggs afterwards writes Joe Quinn. Saturday 10 May will bring the second running of the Downpatrick Lions 3 Lakes 14K Challenge from the Lakeside Inn on the shores of Ballydugan lake with a 7K Fun Run for the novice and junior runners. The race comes at an ideal time for participants in the Belfast Marathon earlier in the week with the 14K providing an excellent warm down for those who completed the full distance with the shorter one doing likewise for Relay participants. Last year all who took part were lavish in their praise for the scenic nature f the course, which takes in the shorelines of Ballydugan, Magheraleggan and Loughinisland Lakes. Proceeds this year will be donated the Down Residential Project and a big turnout is expected.